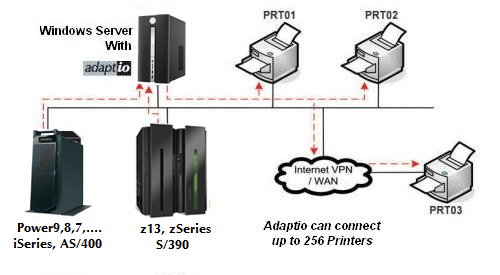 iSeries/ zSeries Print Server Software that Provides "True Device" Printing to Any Network Attached Printer. No more Remote Out Queue Printing Problems. Connect from 1 to 256 Printers per Server Installation. I-O Corporation's Adaptio TN5250e / TN3270e SCS Print Server Software is a Windows based software solution designed to print IBM host print jobs over an Ethernet network via TCP/IP. Running as a Windows service, Adaptio seamlessly converts IBM host print job data streams to PCL, Epson FX, IBM ProPrinter and selected other printer emulations that are addressed through either Port 9100 to a specific network printer IP Address or to an installed Windows printer driver for the specific printer. Adaptio offers the flexibility, speed, and control expected by IBM users. As the requirement for host printers increases, additional printer sessions can be added. With expandability in mind, Adaptio starts by supporting 1 network attached printer, and expands to support up to 256 printers. When printing from an IBM iSeries, AS/400, zSeries or System S/390, Adaptio prints SCS print jobs at speeds up to 250 pages per minute. Adaptio provides bi-directional communications between the IBM host and the printer, preventing documents from being lost in the 'black hole' of network printing. In addition page range printing is supported. Adaptio Enhanced SCS is an Adaptio product that transforms IBM's plain text SCS data stream into a graphical presentation. Pre-formatted documents such as electronic forms, invoices, statements and checks are stored as templates. Enhanced SCS monitors the incoming SCS data stream, selects the correct template and then populates the form with variable data. As an economical optional feature, Enhanced SCS eliminates the expense of pre-printed forms, PSF, IPDS, and custom programming. Printer sessions range from 1 to 256 LAN attached printers. Data conversion is accomplished by Adaptio and sent to the printer via the Ethernet LAN. Adaptio takes advantage of high-speed, high-performance printers. All SCS functions including True Print Complete, and SCS Duplex, Page Offset, COR, Fonts, and Barcode are fully supported by Adaptio . Printers can be attached locally or remotely via a WAN or VPN. IBM host printing to network attached printers can be accomplished easily in an Ethernet environment. Printers are auto-configured SCS virtual printers. Adaptio provides bi-directional communication between the host and the printer. Printers can be addressed directly via Port 9100 to a specific IP address or through a Windows printer driver. Adaptio offers the same reliable, full-function IBM host printing and control found with direct Twinax/coax attached printers. With Adaptio, IBM host print jobs are not lost in the black hole of Remote Out Queue printing. The Adaptio provides bi-directional communication between the printer and the IBM host, allowing error reporting and page range printing. You can download a fully functional version of Adaptio by clicking on the yellow button below. Download instructions for configuring a printer session by clicking here.